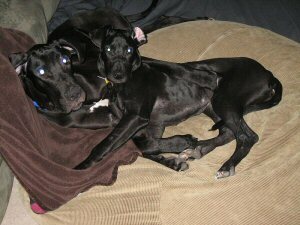 My owners dumped me at PAWS in Middletown when they no longer wanted me. 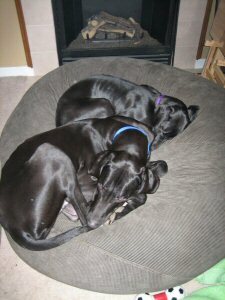 A volunteer working at the shelter that night decided that she had always wanted a Dane so she took me home. A month or so later she gave me to a friend to keep for her until she was able to care for me. The friend then lost her job and also could no longer afford to care for me. I was losing weight and not being cared for properly when another woman came and saw me. This woman promised to get me to safety soon and she kept her promise to me, unlike the others. The next day I was picked up by a HHGDR volunteer and brought to the rescue. I gained my weight and learned to trust and believe in people again while I was at the rescue. I now have a forever home with a beautiful little sister and a great mom & dad! See I even share my bed!! She is a fun kid to play with for a girl!